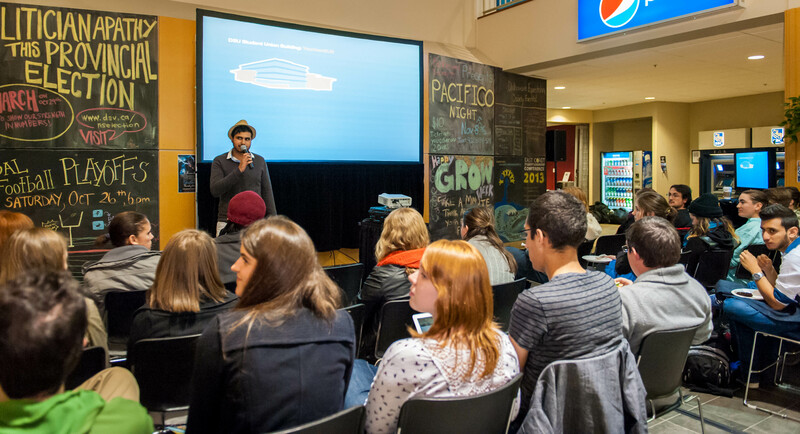 The Dalhousie Student Union (DSU) hosted their last public consultation on the proposed renovations of the Student Union Building (SUB) on Oct. 28. Some levied societies voiced concerns about the plans. The largest opponents of the proposed society hub designed by architect Keith Tufts were the Nova Scotia Public Interest Research Group (NSPIRG), the Dalhousie Gazette, and the Loaded Ladle, the latter of which said they were not consulted before the plans were publicized. “One of the big things we do is let students cook for students in a big way and we need access to industrial equipment,” said Owen Brush from Loaded Ladle, adding that they would greatly benefit from their own kitchen. In the original proposal, the Loaded Ladle would have been slated to serve from the basement, where there is no seating. Tufts said students have been very vocal against moving the Loaded Ladle to the basement. He is reconsidering the first floor to include a spot for them. Supporters of NSPIRG and the Gazette argued that levied societies need privacy and the proposed office space cuts would reduce the services these societies offer, as well as negatively impact their full-time staff. The DSU has recently topped over 300 societies, some of which have no space available for meetings or storage. The open-concept shared space would be exclusively for society use and would amalgamate resources including a conference room and the printing centre, but at the potential cost of privacy for groups that need a separate area to function properly. “Our levied societies are there day in and day out and need a permanent private space,” said Kit Moran, DSU’s athletics commissionaire. Students brought up other issues with the current plans, including a lack of gender-neutral washrooms in the building, wheelchair accessibility and the question of active transportation to and from the SUB. Tufts took note of the issues, reminding the room that the proposal was not a final draft and that change is still very much possible. The cost of the project has been estimated at $8-13 million. A referendum for the atrium addition will take place this spring. If approved, students will pay a $50 renovation fee, up from $25.